Freeport, Bahamas – Marathon enthusiasts and dog lovers can begin lacing up their running shoes in anticipation for the Annual Grand Bahama Dog Days Half Marathon in Freeport, Grand Bahama. Saturday, March 23rd organizers will celebrate their 5th anniversary of this fun event which has raised more than $65,000 for local charities. Dog Days Event Directors Siobhan Antonia-Bates and Nikki Waugh are ecstatic that their dining room table discussion has become an International success and looks to attract more than 600 runners in for their 5k, 10k and 1 mile and Half-Marathon races. The dynamic duo has planned an even more elaborate event this year, by vamping up their ’swag bags’, which will now include UPF Sun T-shirts for all entrants celebrating the marathon’s anniversary. “Runners covet their jerseys, and with International competitors, we want to keep up with the big boys as well as use them to help us advertise our event” said Bates. The event moved to Taino Beach last year and will again feature lots of music, food, drinks, and fresh produce from the Rotary Wagon, Farmers Market, Regal Imports Distributors, The Wild Wagon, and Bahamian Brewery and Beverage Company who have been a five-year sponsor. “We’re very excited to see Dog Days going so strong,” noted event Co-Director Siobhan Antonia-Bates. “The support from our corporate sector, the community, and our families and friends has been mind blowing.” New sponsors Island Bedding and ALIV have also joined long-term event partners BWA-Purina, PharmaChem, GB Power, Katy’s Equipment, Paint Fair, Freeport Ship Services, Barefoot Marketing, and 242newsbahamas. 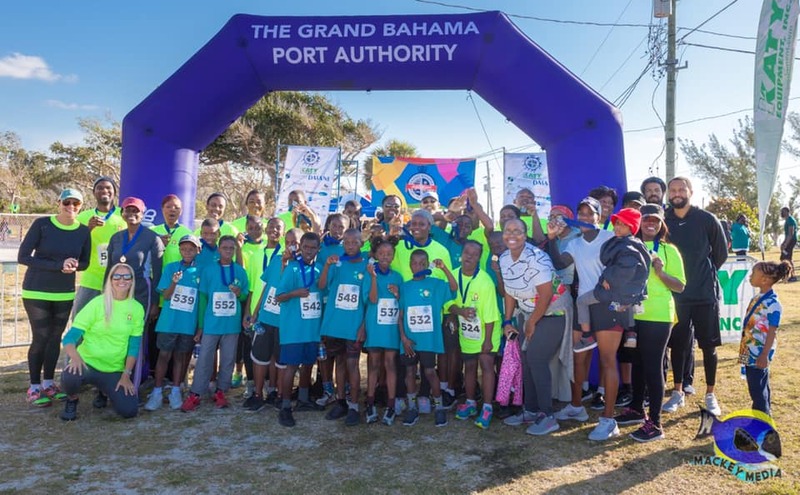 All lending the much needed support for Dog Days Half Marathon, and joining the title sponsor the Grand Bahama Port Authority.